The front AC unit went out..
not for long though because my hero came running to fix it! He has done it all in the past... worked for a plumber, did motorcycle and vehicle mechanics, worked for a painter painting houses, ran a sales business, started ran and then sold his own paintball business and is currently the owner of a franchise we are in process of selling. I have a feeling that all his experience will come in handy while we are on the road! I love that my husband can fix things too. I don't know what I'd do if he couldn't. We rented a motorhome once for a road trip to Colorado from Georgia. When we went to pick it up the air conditioner wasn't working... thank God they got it finished. 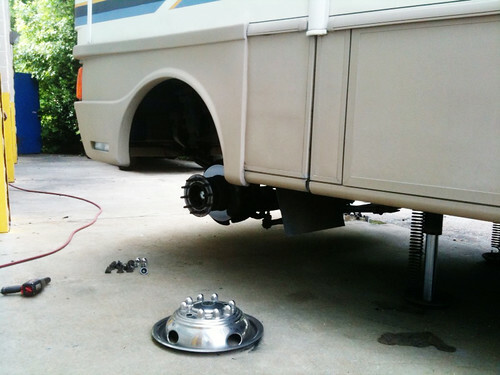 Too hard to travel in a motorhome with no air..
Hey, Heather, thank God for handy partners! 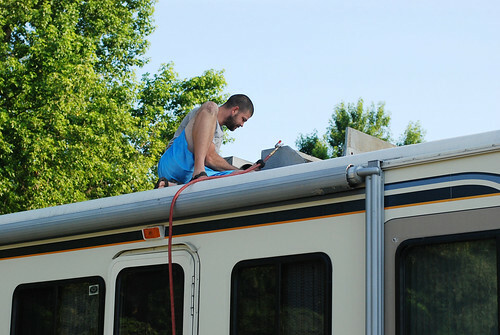 I need to email you again ... we've decided to RV throughout the country instead of building a yurt, and I'd love some advice :). I tried posting a comment under your last post ... I think it's really funny and lighthearted, the way you write about doing battle with your coffee machine! I'm not a coffee drinker, but Jeremy is ... he's a monster if he doesn't get his morning coffee :).